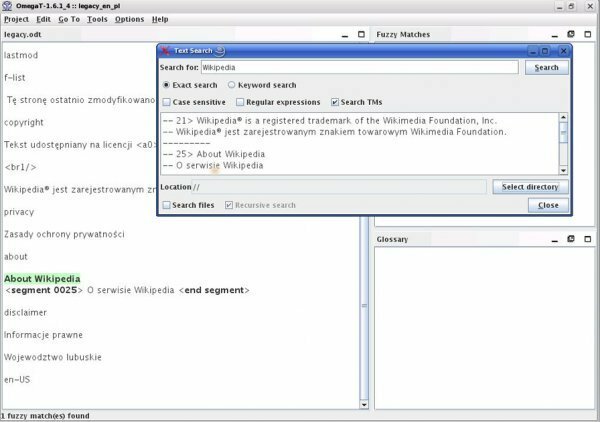 OmegaT is a free translation memory software tool that assists with translation on a computer. A tool intended for professional translators, OmegaT assists the user by managing source documents, translation memories and glossaries in translation projects. Contrary to "machine translation" tools which translate content for you, OmegaT assists the human translator with translation resources. It is used for translating content in a wide variety of formats (including OpenOffice documents, HTML and others) and has many features that help when translating materials. When translating a document with OmegaT, it uses its translation memories to suggest to the translator what it thinks segments of text mean. Suggestions may or may not be taken, but when the translator does decide what she thinks the text means, OmegaT stores her translation in the translation memory which it will then suggest as a possibility later if that same segment is come across. In this way, the translator retains ultimate control over the content of the translation but is given an extremely helpful tool for assistance. OmegaT is free software licensed under the GPL.